Fitting transmitter collars on wolves or telemetric studies have never been so thoroughly carried out in Estonia as during recent years, with the purpose to distinguish one pack from another sufficiently well and not to overestimate the numbers of wolves. A common opinion tends to be that wolves live in smaller territories, and that they much more numerous than their actual number. The Kikepera pack for instance has surprised researchers with their large territory that according to present estimates is 980 square kilometres. When two male wolves were fitted with tracking devices by game researchers in 2012 their common pack was called the Halliste pack after the home territory location. 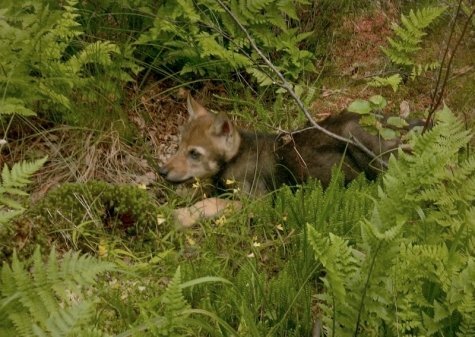 The Kikepera wolves living close by had been studied earlier and so it was convenient to look for suitable wolves from the neighbouring pack and one year later to turn to the Kikepera pack again when it was necessary to find a female wolf whom to fit with a collar. This autumn alpha females from Halliste as well as from Kikepera have collars; it provides an excellent opportunity to explore the relations between neighbouring relations. But in order not to run ahead of our story we start with Hall (Grey) and Habe (Beard). What Habe was to Hall - a brother or other relative - is not known, but it is thought that neither probably was an alpha male in the pack. For research such facts are important since young wolves always make tours for orientation outside their own territory together with the leader male, which makes the pack’s territory look artificially oversized. Hall’s and Habe’s tracking collars have transmitted valuable information and provide an adequate overview of the entire pack’s movements. When we succeeded in catching Hall in a trap in September 2012 and fitted the tracking device on his neck the Halliste wolf pack consisted of 8 individuals – 4 adults (1 female and 3 males) and 4 cubs. In addition, a solitary female wolf that from time to time moved with the pack also lived on the same territory. The Halliste pack thus was a decent-sized pack but regrettably this structure only remained until the end of December when an unusual disintegration took place. Researchers suddenly discovered that only a group of 3 individuals was moving in the territory – Hall, the other collared male wolf Habe and a female wolf. By itself the disintegration of a pack into subgroups would not be rare if it had occurred in January prior to the heat period, but in this case something happened to the leader pair in the pack. What, is not exactly known but suddenly they were just not there. Tracks from solitary cubs were still seen by the researchers in the nesting area for 21 days after the disintegration of the pack, but then not even those were seen. Such a sudden scattering of a pack generally points to the death of at least the leading female. From Finnish researchers reports are known where the mother perishes and after that the male also leaves for some reason, leaving the cubs on their own. On the Halliste territory hunting wolves is however prohibited and adults die comparatively rarely from natural causes, therefore regrettably the possibility remains that poachers are culpable. The journey of the abandoned pack to Latvia also also suggests an enigmatic death. Usually a pack does not roam in strange territory. The ”Latvian trip” in January 2013 made Halli’s average number of kilometres of movement artificially large. Since it was a once-only journey we believe that they went to search for their missing companion. The trio reached Latvia on their search, and stayed there for some days; we had to contact our Latvian colleagues, to ask them not to let hunters shoot our collared wolves. We didn’t know what was going to happen with the wolves. Fortunately nothing happened, they stayed for some time on the territory of an Estonian-Latvian cross-border pack, most of whose leaders evidently had been shot, and then returned. At present there is again a decent-sized pack in the area. That the animals may go searching for their comrades is corroborated by the experiences of Finnish researchers with wolves. Our northern neighbours have been observing the behaviour of packs after the death of the alpha female. There are strong ties between the wolves, lost companions are mourned. From the Finnish researchers it is also known that after a hunt the surviving pack members howl more than average and are distressed and search for their friends. Failing to find their lost companion the trio returned, and after some time male wolf Habe separated from the others. It was at the end of January, the break-up period of packs, and probably he left the territory since we only noted one wolf pair moving in the Halliste pack territory until the snow cover melted – male wolf Habe and his female companion. In early February the behaviour of the pair showed quite clear manifestations of territorial behaviour – they moved around widely, marking territory and announcing in all ways the occupation of the area by Hall. In addition the heat period of the female started, and it is known today that in the beginning of May this year  progeny who evidently carry on the genes of Hall and his partner was born in the territory. In 2013 the Kikepera alpha female was also fitted with a collar with transmitter, so we will briefly describe the two neighbouring territories. There is a significant difference between Halliste and Kikepera: while large bogs reign in the Kikepera region the classic landscape of Estonia dominates in Halliste: forest alternating with small fields. For wolves bogs are not suitable habitats because there is less food, and so a pack living in a bog needs a larger movement area. That the hypothesis is valid can be seen from the results from the telemetric studies. The Kikepera pack has an area twice as large as the Halliste pack’s. In the area most similar to our environmental conditions, Scandinavia, the size of the habitat of the studied wolves varied very widely. The territory of the studied 28 wolf packs ranged between 259 and 1676 km². The population density of roe deer was found to be correlated with the size of the habitats - the more roe deer the smaller the wolves’ territory. 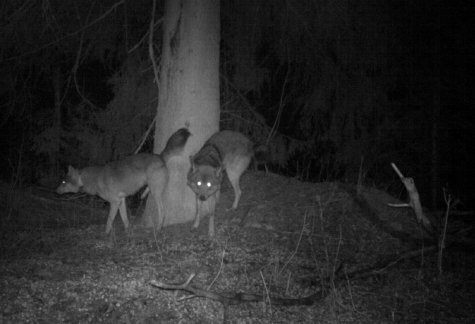 The relation also holds for our wolves – on the Kikepera pack habitat significantly fewer roe deer move than in Halliste. That the territory depends largely on the availability of food can be exemplified from Alaska where the territory of one pack can be up to 30 000 kilometres. The issue is however more complicated: sometimes a small territory does not mean a plentiful dinner table but simply that there is little space. For instance in Lithuania where there is little forest and suitable habitats are small, a wolf pack will have to make do with an area of only 100 – 200 square kilometres. But wolves adapt to conditions. Although we only succeeded to follow Hall for seven months it was proved that the territory of his pack covered about 450 square kilometres which is average for Estonia. The telemetric studies of the female collared in the Kikaspere bog have only started but already it can be stated that her pack’s territory is twice as large. Since the two females collared in 2013 come from two adjacent packs it is a good opportunity to study the behaviour of neighbouring packs: a clear border line is maintained between the packs and in addition there is a buffer zone. From this can be deduced that the areas of the packs don’t overlap. New studies with fresh data are however to come. A trail camera captured the Kikepera pack’s leading pair at marking their territory on November 13th, 2013. The border to the neighbouring pack is strictly upheld. The territories of the packs are quite stable over time and basically retain more or less the same boundaries until the last member of the flock is gone. The article originally appeared in journal Loodusesõber in December.